The selection of a herd sire is by far the most critical factor in determining 50 percent of the genetic potential of every breeder's future calf crops. Any decision on a herd bull should be well planned and not a sentimental or hasty one. Often, the auction bargain may not prove to meet the highest requirements either. In this article we shall deal with the major considerations and decisions involving sire selection. EVALUATE COWS: The cows on which the new sire will be used should largely dictate the type of bull needed. Many combinations of problems can be corrected through selection of a bull that is strong in these areas. The opposite also holds true; when a cow herd has weaknesses and the new herd dire has the same one, these adverse characteristics are strongly concentrated, making the traits dominant. Even the best bull may not be able to overcome these problem traits in subsequent generations. Therefore, the weaknesses of the cow herd should be your first consideration. REVIEW GOALS: Your goals for future quality requirements will be an important factor in packing out a bull. In every project, different people have different goals. The person we can appreciate the most, the person every breed organization depends on is the one who is a perfectionist and goal all out for quality. The perfectionist will drive to the backside of Kalamazoo to purchase that one best bull. He will not sell, at all, the top results of his herd. Those best ones are cherished like gold. This person's goals are different from the person who just has a few head to keep the grass eaten off, and doesn't get involved enough to keep up with the breed progress. In each generation, we can expect a possible breed improvement of 2 to 30 percent with good management. Goals can be established that will determine the percentage of herd improvement by the amount of study and diligence each breeder wants to apply. GENETIC CONSISTENCY: The Mexicans used to say, "Alligators don't have puppies." It's the same way with bloodlines. Assuming that a bull sires true to his ancestral lineage, let's consider his bloodlines first. A mediocre cow and bull may sometimes produce what appears to be an outstanding son. He looks like herd sire material. He may possibly be the one-in-a hundred that outsires all his ancestors, but here's a stronger possibility that his calves will grow up to look like his own sire and dam - mediocre! A safe principal to follow is never use a herd bull unless you want to raise calves like his sire and dam. Nine times out of ten he will produce his own genetic traits. To be on the safe side, a young herd sire out of the best cow and bull in the breed would be an ideal starting place. So what, if you have to drive a thousand miles to get him? The pleasant satisfaction of owning quality will remain long after the sting of the high price has gone. ANCESTRY & DISPOSITION: The bull's dam should have many qualities. Her ability to produce ample rich milk to raise a fat calf every year is a must. Think for a moment, of the opposite: What would it be like three years down the road to have a pasture full of two-year -old replacement heifers sired by a bull of low milk-producing genetics? The heifer's calves are poor, lacking appeal, short of disease resistance and slightly hard to sell. That problem can be eliminated in sire selection. The cow with the biggest, fattest calf at side proves she is a top milker. When she can produce this way and still maintain good flesh herself, you're looking at a good, thrifty cow. That is an important quality for a cow herd. Problems of disposition are hereditary just like color, horns and conformation. To use a bull whose ancestors were flighty and nervous is to plan on raising that kind of cattle. Most people don't appreciate a "heads-up bull" [one that throws his head up and leaves the area when you come near]. COLOR: Color is a toss-up! Everybody has his choices and preferences. Our breed has the color factors to create the colors of the rainbow. That beauty lies in the eye of the beholder. The choice of a herd sire will usually reflect the breeder's preference for color. CONFORMATION: One of several critical areas of Watusi herd sire evaluation is conformation. Other breeds consider conformation the major and sometimes only criteria. When we ignore the importance of conformation, it shows in comparison to other competitive breeds . . . it shows in sales results . . . and eventually it shows when we sell the worn out cows and bulls for hamburger. The meat on the platter is, of course, the final showdown. And the growthy, correct carcass is always the most profitable. Calves from poor conformation bulls will always require more time and feed to equal the growth progress of the better ones. HORN GROWTH: The Watusi's most distinguishing feature is horn growth. The horn is symbolic of strength, power and majesty. Watusi horn shapes come in a number of acceptable versions. The Lyre shape, which is very high and rounded, was popularly bred for in Africa. There are also horn shapes that are more lateral and also wide and upsweeping. The diameter of the base of the Watusi horn also has some variance but for the part the bases are very large. The Percentage cattle show variance in horn shape and size which is influenced by the outcross breed involved. Maintaining optimum horn size and growth in breeding programs is an important part of selection in breeding. Watusi are known to be the largest, longest horned cattle in the world and in setting goals for a breeding program breeders need to keep this majestic trait of the Watusi cattle in mind. 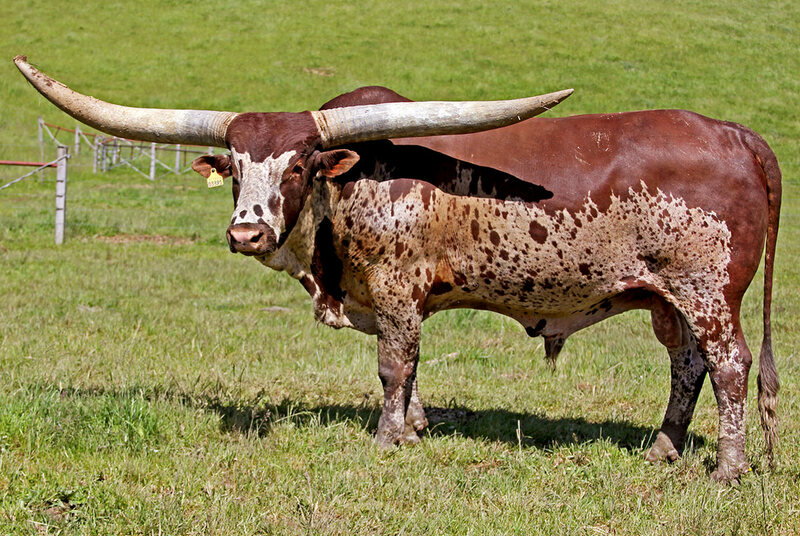 In selecting a Watusi herd sire, horn growth is a very important consideration. SIRING ABILITY: The supreme test of a herd bull is siring ability. If a bull is not capable of siring one son better than himself within three calf crops, he's a bummer. A true breeding animal can and will sire progeny superior to himself. The size of the future must be better than the past because the breed is progressing so fast, we must improve just to keep pace. Even with the best study and planning in bull selection, it's poor business to trust any single bull with a valuable herd of cows for very many years. A good, safe program is to use a bull only one or two years, then allow his offspring to mature and use him again on the females he mated best with. A bull has the authority to do a good job, or totally waste your year with sorry calves. Whatever you approach to herd sire selection - diligent study, miles of search, planning, money, or the flip of a coin - the quality of your results will reveal your understanding of this most serious of all decisions in the cattle business.